I have learned how to make many free beverage recipes which I have collected from friends and family over the years. Before getting to these recipes, I would like to say that I have some basic rules to follow. Good quality drinking liquids are a necessity when hosting any type of event; always good quality water. Although some recipes are complex using many ingredients, a beverage can be as simple as cold fresh water. Actually, what I do and I express that all host do practice is to offer good water every time they entertain guests. For some people, water is all they drink. When I talk about water, it should be good filtered water. We keep a tank of fresh filtered water on the counter top at all times; beside it is a bowl of lemons to add a little fresh juice. For some occasions, like picnics or cookouts I have found it convenient to have bottles of water available on ice for guests. For some types of gatherings, it is not unusual for all wishing to attend to contribute to providing beverages. Under these circumstances, the attendees decide what they want on hand to drink and they usually give a certain amount of money to purchasing the drinks. For these times, the one in charge of the event or even hosting the event is not expected to provide free beverage recipes aside what has been decided upon. Serving adequate amounts and a variety of free beverage recipes when entertaining is as important as the food you serve. The key to this is knowing your guests and what they like to consume. Like food, if you have invited a diabetic guest, it is important to have available drinks for them. Unless you know for sure that none of your guests drink tea or coffee, I recommend that you serve one of these; preferably coffee. Coffee is enjoyed by people all over the world. 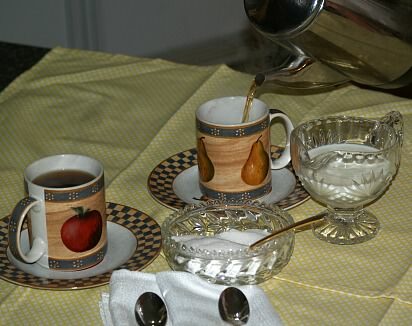 Rather than serving free beverage recipes involving coffee or tea, simply offer a selection of condiments. These will be different among different cultures; include ones which are popular with your guests. Different types of gatherings (or parties) require different types of beverages. I mentioned picnics and cookouts. I have found it so much more convenient to buy bottles of water and a variety of sodas for these events. Shortly before the event starts pack them in ice in containers or coolers. Often I have used large galvanized tubs. These fit into the theme quite well. It only takes a few minutes for the drinks to get ice cold. .One “hot topic” for me has been gatherings which are held from late morning to mid afternoon. Now I know that this varies from country to country and really from one person to another. It also may be that I am a bit “old fashioned”. Often at these gatherings alcoholic beverages are served. Sometimes this is the only beverage offered besides tap water. Most of these parties also have children in attendance. For me, it has always been unacceptable to serve any alcoholic beverage before evening dinner about 5:00 to 8:00 PM. When children are involved, alcohol should be avoided. Certainly when alcohol is offered, other free beverage recipes should be offered. 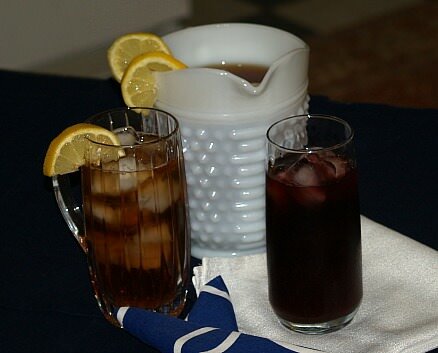 There are many simple free beverage recipes which are fast to make when entertaining. Drinks like ice tea, lemonade and punch are a few staples which are always pleasing. If you want to “Wow” your crowd, you can go with something a little more involved. EXPRESSO COFFEE is loved by many people. This can easily be made at home without a specific machine. In a percolator, use about 4 tablespoons of dark roast coffee to each ¾ cup of water; serve in demitasse cups CAFÉ AU LAIT can be made by using this same strong coffee and adding ¾ cup of warm milk to each mug. A good formula to make REGULAR COFFEE is to use 2 tablespoons of ground coffee for each ¾ cup of cold water. 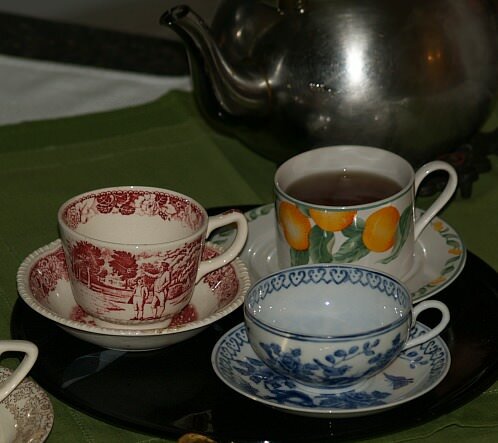 SIMPLE CUPS OF TEA can be served individually by pouring ¾ cup of boiling water into a cup with one teabag. ICE TEA is very popular during the hot summer. Place 1 tablespoon of loose tea in a tea ball, 3 regular size tea bags or 1 family size tea bag in a tea pot. If SWEET TEA is desired add ¼ to ½ cup of sugar to the hot tea. Pour 2 cups of boiling water over the tea, cover and let steep about 5 minutes. Remove tea and stir in 2 cups of cold water; serve over ice. Makes 1 quart. Boil sugar in 2 cups of water until sugar dissolves. Combine sugar/ water with all other ingredients EXCEPT GINGER ALE in a large glass container (About 1 gallon size). When ready to serve remove tea bags and add ginger ale. Combine in a large mug 1 package hot cocoa mix with 1 cup hot coffee. Garnish with a dab of whipped cream and sprinkle with grated orange peel. Combine sugar and water in a large saucepan; heat slightly until sugar dissolves. Add frozen limeade and juices from limes; mix and pour into a shallow pan. And freeze. Remove from freezer about 1 hour before serving; break into slush. Boil sugar and water for 10 minutes; add cloves, allspice, cinnamon and ginger. Cover mixture and let set 1 hour. Strain mixture and then add orange juice, apple cider and lemon juice. Bring to a light boil and serve. Combine and mix together all ingredients. Use 1 to 2 teaspoonfuls to 1 cup of boiling water. A popular free beverage recipe in the winter. Combine and blend all ingredients. Place ¼ cup of mixture in a mug; fill with 1 cup hot water. This is a very tasty Irish free beverage recipe. Soften fruit juice in water. Add ginger ale and food coloring just before serving. Top with softened sherbet; punch will bubble during early servings. COMBINE all ingredients and heat slowly; serve warm. NOTE: Bitters can be made by combining different herbs, spices, roots and peels with alcohol. The alcohol extracts the flavor so it can then be added to drinks and other recipes. I often add vanilla beans to vodka or brandy. Among other common ingredients are cinnamon sticks, whole cloves and orange peel.